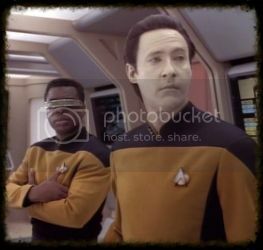 Summary: Follows immediately after the episode â€œAll Good Things.â€� Picard flashes back in time and recalls memories from his past. 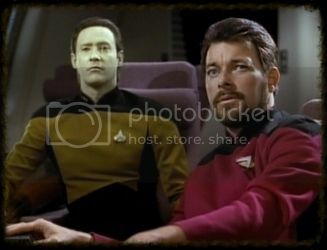 Summary: Using extraordinary literary license, Q gives Riker a unique gift in the form of parallels with a nineteenth century English classic. Takes place within the time of season 7, approximately 2371. My version of the scene right before Ensign Ro interrupted Riker and Troi in Season 5 Episode 14 Conundrum. What if she hadn’t interrupted? 5 year old Laura Riker is excited for her first day of school. When Commander Riker and Deanna Troi’s daughter 2 year old daughter Kaitlyn comes down with a virus that was eradicated 10 years before, it’s up to Doctor Crusher to stop it from spreading ship-wide and infecting the crew. Riker enjoys the little things in life while playing dress-up with his girl's Laura and Lily ages 5 and 7, and having a tea party. Life seems ideal for Riker and his growing family, but when his daughter Laura is diagnosed with Epilepsy, things become a little strained. While picking flowers for her mother, 4 year old Laura Riker finds herself lost on a planet she’s never been to before. Can her parents find her in time? Will and Deanna have a conversation about their growing family. As the USS Enterprise (NCC-1701-D) spirals to her doom, William Riker wonders if he and his crew will survive the next few minutes. Laura Riker becomes a big sister, but isn't so sure she wants to share her daddy with her little sister. Written for Weekly Free Write #125. 7 month old Laura takes her first steps. Written for Day #2 of Prompt a day Challenge. 2 month old Laura is fascinated by the color red of her father Will Riker’s uniform. How would a 24th Century version of Carl Sagan see the discovery of a long-dead humanoid species that is the origin of nearly all humanoid life in the Milky Way galaxy? Written for a prompt a day challenge. “Daddy? Where do babies comes from?” Riker fidgeted on the couch. How was he going to explain this one to his four year old daughter Laura? Summary: The Enterprise comes to the aide of the badly damaged U.S.S London and in the wreckage Riker finds a woman and a little girl who mistake him for someone else. Summary: The fight continues against the Andromedans with a turn in the tide. Summary: A series of short vignettes, depicting various characters' interactions with their "arch-enemies".